I was planning to start a new rotation at this point, but still haven't quite decided on how I want to go with that. I was thinking a monthly rotation with 3 focus pieces, 9 "favorites" allotted 3 slots a month, a BAP, and a slot for everything else (in reverse alphabetically order). But I've been working on my web pages lately and seeing all of the stuff I have going makes me want to work on everything! And so then I was tossing around the idea of having 1 to 3 focus pieces and the remaining slots alphabetical. Or even to just start in alphabetically and work through until something else started screaming so loudly I could no longer ignore it. The idea has become moot, though. I find that I am too focused on Darkling right now. 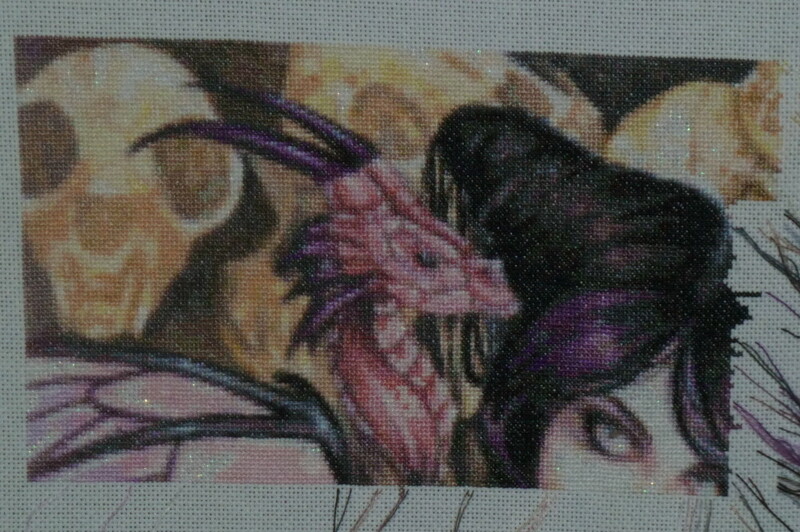 I am getting so much more done on her than I have on anything in a long time (1,200 stitches yesterday!) that I just don't want to stop. I finished the third page in two weeks, which is really a major feat when you consider that I was on our annual Knoebels trip for almost half of that time. So for now I will stick with her. So... I did set up a new rotation, but then got seriously caught up in Darkling Mini. I haven't made so much progress in a long time. 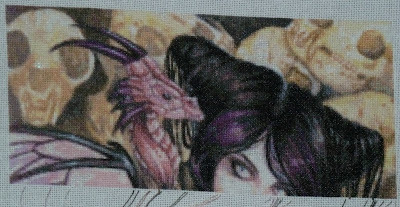 I changed the way I'm stitching a little and I think that may have helped. I was stitching in 10 x 30 blocks, moving across the page. I changed to working 10 x 10 blocks only and it seems I am getting a lot more done. I will keep on with this for the next couple of days until I go on vacation with the extended family. I'm not sure what will happen when I'm back from that... I might finish up the third page or I might end up starting up with the new rotation. I'm not sure why people are having difficulty adding my blog to their pages, although it could possibly be that I've never upgraded my template... the one I'm using is very old (back when you needed to know html to do any real editing). I really like mine (I actually paid money for it! ), and I'm too lazy to figure out how to switch it over. So I guess blogger might just hate me.